In response to a recent query from two dear friends, who may have erroneously assumed we possess special insider expertise about the Florida Keys (having spent exactly one week there) we cobbled together our thoughts and impressions for their journey south this coming November. We loved our experience in the Keys and will definitely return soon. We drove across Florida from the Gulf side via the historic Tamiami Trail, through the Everglades, and entered the Keys, officially, crossing the Card Sound Bridge into North Key Largo. We learned the Overseas Highway runs over a hunbdred miles from Key Largo to Key West, following what had been the roadbed for the Overseas Railroad, completed in 1912. The railroad was destroyed in 1935, with the remaining bridges and roadbed sold to Florida for about what many of our homes cost today. We left the crush of Miami-Dade and entered Monroe County, or, as locals refer to it The Conch Republic. Everywhere atop buildings here, we see the US flag, the Florida State flag, and the Conch Republic flag. Folks here take this seriously. Or as seriously as possible in a “republic” where happy hour never ends. In April of 1982, in response to a federal blockade at the northern entry to the Keys (as part of the “war on drugs” hysteria at the time) the citizens of the Keys, lead by Key West’s Mayor Dennis Wardlow seceded from the Union, then the following day, surrendered and demanded $1 billion in war reparations. This is our kind of republic! Locals even have a Conch Republic passport. For your trip, five days is enough. Miami to the southern tip at Key West is a few hours driving time. Traffic can be an issue on Highway 1 / the Overseas Highway as it clogs with accidents from time-to-time. But getting all the way down to Key West is easily done in a morning. When we visit the Keys again, and we surely will, we plan to pick one place and set up camp there. We moved halfway through our week, and wished we had not. We loved driving the Overseas Highway, with water on both sides in every shade of blue and green imaginable, reaching to both horizons on the Gulf and the Atlantic sides, a ribbon-like tightrope walk through dozens of keys, tropical savannah, blazing sunshine, mangroves, bays and beaches. It is an entry point to the largest area of natural coral reef in the United States. It is indeed breathtaking. Neither of us really kicked into that “We really dig this place” mode until we got farther south. Key Largo was largely unimpressive, as were the next few towns. But frankly, we think that is more what we might call the “Malibu factor”. Have you ever driven PCH through Malibu? The highway is jammed. Local businesses and the backs of someone else’s grand beach place is most of what you see. PCH in Malibu and Highway 1 in the towns on the upper Keys seem to be the “back door”, or the “alley” as it were. The real cool view must be of the homes and businesses from the water, which we didn’t see as an auto driver. Everyone seems to have a boat. Some people don’t have cars. A number of places we went for meals, music or drinks, folks arrived by boat. Any restaurant or bar worth its salt is on the water and has a large dock. So, while we thought the Overseas through Key Largo was kind of like El Cajon Blvd. in San Diego, we give it a pass by saying we didn’t really experience the place properly. Next time, we’d like to boat the length of the Keys. Now there is a view. Dove Creek Lodge is where we stayed in Key Largo. Accommodations are not luxurious, but are clean and the grounds are nicely maintained. They have kayaks free to use for guests, cold breakfast is included, and you can easily paddle into the mangroves. Dove Creek is on the Atlantic side, away from the busy highway, so it’s quiet, has a decent pool, a hot tub, with a restaurant and bar next door so you can walk to dinner and live music. We decided it was better eating at the outdoor bar than inside in the restaurant because of the great sunset views, live music and “boat watching”. (The bar shuts down early enough so you can get a good night’s sleep). If your itinerary calls for a night’s stay part way down you can check in, have a paddle around the area and not have to drive anywhere for dinner. Below Key Largo are Tavernier and Islamorada. Islamorada looks like a place we could live. It’s a bit more of a town, with more amenities and support, but on the highway through town, we still had that same feeling of, “this is a little crummy”, because ALL the action is in the water, in the mangroves etc. Islamorada is dubbed the Sport Fishing Capital of the World. Who are we to argue? There were marinas, charters, boat brokers, boat repair joints everywhere. If we ever do move to the Keys, we’d have to get a little boat. Or a big boat. Or both. We’ve already picked ours out. One is a sweet little 18’ Maverick Mirage poling skiff. Great for sneaking around the mangroves with it’s minimal draw. The other, suitable for runs to Havana (Cuba Libre!) or Belize is the 54-foot Grand Banks Heritage EU Trawler. Nice, huh? Can we borrow five hundred large? As we traveled south, we passed through Duck Key, Marathon, Big Pine Key, Cudjoe Key and Sugarloaf Key. At Big Pine we drove around quite a lot, thinking that real estate was reasonable, and the feeling was VERY small town and VERY rural. We liked Big Pine because it reminded us of some parts of Kauai – a large area of the key is a refuge for the indigenous and endangered Key Deer, known to be smaller and more delicate than most. So with that you get a refuge for all sorts of other wildlife. We didn’t stay there, just checked it out on the way south. There is good snorkeling and it’s not far to Key West. Speaking of environment and preservation, we know Florida has struggled with development and runaway destruction of the Everglades and some of the coastal areas. From what we could learn, this is turning around, and there are major conservation and protection efforts underway all over Florida. We were particularly impressed by the level of recycling, electric-powered vehicles, bike lanes, and most importantly, the amazing proliferation of protected areas, both on the Gulf side and in the Keys. Locals seemed to consistently have a high level of awareness of the predicament their delicate home faces. South of Big Pine, we stopped for food on Summerland Key, at a joint called Mangrove Mama’s – a funky, local landmark for 30 years. Outside there’s a shaded patio and locals as crusty as the cracked conch. This ain’t health food but it was delicious. We had the grouper basket and the seafood quesadilla. And yes, it is okay to have a beer at eleven in the morning. Or two. For us the Grand Prize of the trip was Key West. Yes, it is all too easy to criticize Key West. It is one more of those places (can we suggest Aspen, Yosemite Valley, and Sedona) that have been “loved to death”. It is crowded, tourist-oriented, a little schlocky and stuck in some Jimmy Buffett past, with fat drunk guys wanting it to be 1979 again. But along with that: Key West is historic and romantic (even if you are not a Hemingway fan), with beautiful, tree-overhung streets through old neighborhoods, grand old houses with ceiling fans, palms and flowers of every description, outstanding food and interesting local people. The Hemingway House, the Truman House and an endless calendar of celebrations, writer’s conferences and art festivals offer solid cultural appeal. And, there are charters for every type of fishing, diving and exploring. 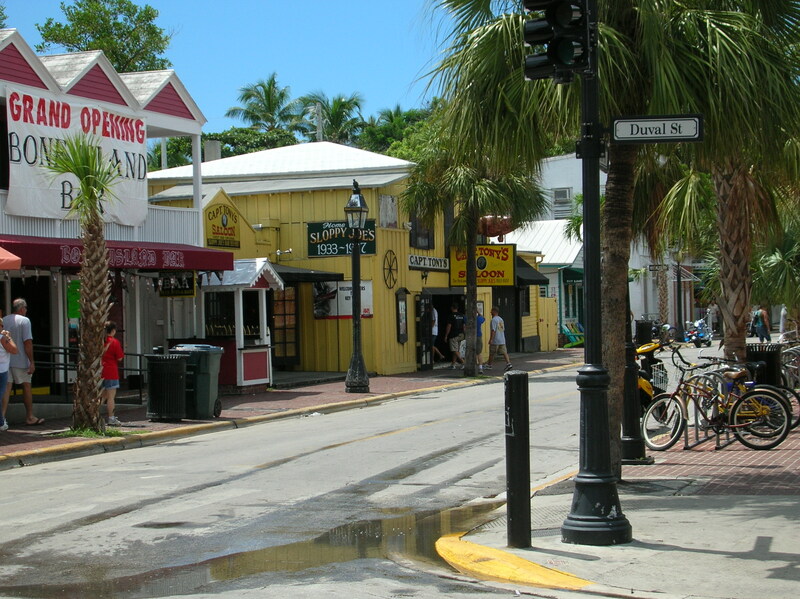 Key West is host to numerous annual festivals. What’s going on at the time will change your experience dramatically, both in terms of crowding, hotel availability and pricing. Here’s what’s going on in November. I recommend you check your dates and see what’s happening at the time. It sounds like you’ll be there after Fantasy Fest is over, (which is a good thing or a bad thing depending on your taste for decidedly adult Mardi-Gras like shenanigans.) We were there New Year’s Eve and it was wonderful: as wacky as we expected, but at the same time, it had a gentility and historical elegance we likened to New Orleans. In Key West we stayed at the Merlin Guest House, on Simonton Street, one of several properties associated with Historic Key West Inns – all unique, older properties, varying in location, size, amenities and access. Online reviews abound for these lovely old places. Simonton Street is quiet and mostly residential, but it’s an easy walk to the lunacy of Duval with its bars, live music, restaurants and tourist crunch. The Banyan Resort was also highly recommended, looked charming, and we would have stayed there, but it was sold out when we made reservations. We recommend you check it out. There are so many of these, we will never stay in a standard chain hotel in Key West, always preferring a small inn or guest house that is at least 100 years old. Whatever you choose, you want a place with a shaded courtyard for privacy and relaxation. You have to get really specific with your reservations, since the properties are old and unique and the rooms vary tremendously in size, air movement and the amount of light. Some of the rooms are on the street – don’t do that. There are idiots on mopeds at all hours of the day and night. You want to be back in the courtyard area, on a side street. The Merlin was very quiet at night, and after wandering around all day in crowded places, it was a welcome respite. We noted that if we stay at Merlin again we’ll try to reserve the King on the upper level that has it’s own balcony. It looked to us that it would be perfect for taking in sunrise with coffee or sunsets con Mojito. Kitty-corner to the Merlin, across Simonton Street at Petronia, is a tiny restaurant called Deuces Off The Hook Grill. We walked to dinner on New Year’s Eve and had one of our best meals of the entire trip. We ate at the bar, even with having called ahead, and enjoyed grilled hogfish on a tip from the barkeep. We discovered this lovely, delicate, sweet fish that we understand can only be speared. Deuces is a small but very popular place, so make reservations. Finally, another food stop you have to make is DJ’s clam shack on Duval Street. This is a walk-up joint, with a tiny front porch. Grab a seat there for people watching. GET-THE-LOBSTER-ROLL! Or get the overstuffed one to share. You will need a fork. Clams, lobster rolls, conch fritters and fried shrimp. Don’t tell the cardiologist! Our favorite live music and drinking go-to was Blue Heaven (At the corner of Thomas and Petronia). Plan to sit outside under the trees, dig your toes into the sand, throw back a Mojito or two, enjoy the roosters and relax. We had dinner during one visit and it was quite serviceable. This is not Michelin Star territory, but the fish was local, fresh and well-prepared. This feels like funky, classic Key West. We discovered our favorite new songwriting duo there – The Moon and You, touring from Asheville, North Carolina. We returned to see them twice. We dumped our car rental upon arrival in Key West. If you’re driving down from Miami, we recommend doing the same, renting some bikes, and then flying out of Key West. We took the evening ferry from Key West to Ft. Myers, when we left, and will not do that again. It was nighttime, so scenery was absent. The boat felt vaguely Soviet-era like in Ho Chi Minh City, crowded, diesel-perfumed and packed with fried, hung-over tourists. Fly out of Key West, or take another day and drive back to Miami. As for snorkeling; we didn’t know where to go and we learned the hard way, trying a few spots unsuccessfully. Although there is a massive National Marine Park accessible from several keys, there is very little great snorkeling right from the beaches. The best reefs are reached by boat and there are lots of charters. Here’s a site showing the best snorkeling. The boat companies rent snorkeling gear so you don’t need your own. 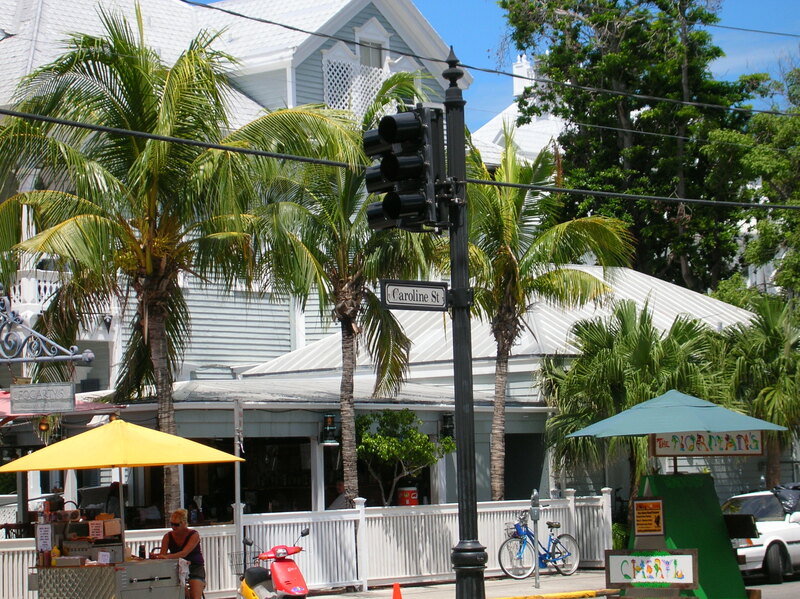 Finally, we’d say Key West is one of those places you have to take for what it is. A place with colorful history, sometimes too many tourists, sometimes really dumb tourists, but interesting architecture, picturesque older neighborhoods, good food, music, and colorful locals. We were surprised at how friendly the locals were – we didn’t experience that jaded anti-tourist feeling from anyone anywhere. 1. If you don’t like being in, on, under or otherwise with salty water, don’t go. It’s all about the water in the Keys. Snorkel, dive, swim, paddle, stand-up paddle, or dangle your feet off the dock every day. 2. If you don’t like fish, crustaceans or mollusks, and I mean to eat, with your mouth and your heart, three times a day, don’t go. Yes, there’s a lot else to eat. 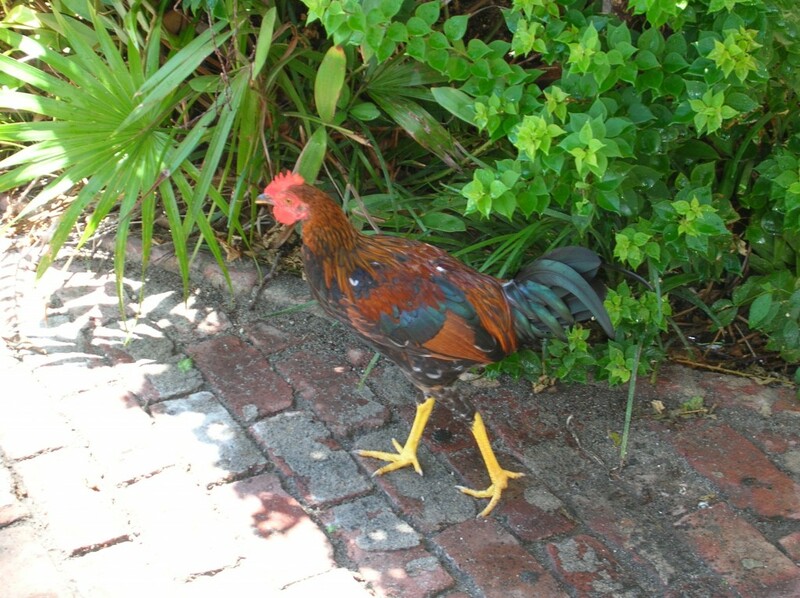 There are great restaurants of all types in the Keys. But this is the “fishing-est” damned place we have been, including Hawai’i. We ate fishes we’d never heard of, happily. Forget your diet as it relates breaded and fried fishes. Life is short. Eat Conch and Grouper sandwiches. Eat everything. 3. Rent stuff to play with outside. Kayaks. Bikes (we had bikes in Key West). Go on a snorkeling charter to the reefs. The best snorkeling (we understand) can only be accessed that way. 4. Do everything you can to not drive in Key West. We dumped our rental car and rode bikes for four days. Traffic is horrible there and you can bike everywhere. Plus, you are GOING to want drinks. This is “Buffettville” after all, and avoid those DUI’s, to be sure. 5. Read South Florida crime fiction the entire time. Carl Hiassen is our Number One (Bad Monkey is his newest book and it is hysterical). Randy Wayne White. Tom Corcoran. Tim Dorsey. Elmore Leonard. John D MacDonald. It sets the tone.6. 6. There is great music, but what you typically find is the guy or gal or band running through their set list at the bar or restaurant or club, quite competently to be sure, but it’s a little rote. Look deeper. We found some utterly brilliant music. 7. The trip to Dry Tortugas National Park was recommended by EVERYONE. We didn’t do it. It’s a full-day commitment. People rave. 8. Folks are friendly. We talked to everyone. This is the best way to learn about any place. Plus, it doesn’t matter so much what is precisely “true”. Chalk the inaccuracies up to local color. 9.Beaches seem to be a little lacking in the Keys. This is not Del Mar Beach or Haleiwa. There are a few that are nice. Bahia Honda between Pig Pine and Marathon is one of the best. 10. Finally, we’ll share a perception we both had in Key West. A lot is made about it being the “southernmost point in the USA” It’s not. Hawai’i is. But for the continental US, okay, yes. But you surely are way down south. Like Cabo San Lucas south. But the feeling we had was that “we are not at the southest of the north, but rather at the northest of the south…” or something to that effect. Meaning we really felt and feel our place is in the Caribbean and Key West is the northern edge of that world. A very exotic feeling we still cling to. Oh, and did we mention to eat a lot of fish? Thanks to “Mojito” Dave McCatty for his great images of Key West. See www.mojitodave.com for how to buy Dave’s newest CD, “Key West Dreamin'”. You’ve nailed it. Made me remember my time in Key West, which was a business trip with a bunch of guys I worked with. We terrorized in fine style, and we snorkeled – via a little charter trip. The visibility was poor the day we were out (too much wind), but heh!, we came, we saw, we snorkeled. And we ate fish! Wonderful review of a uniquely American spot to go.